Excited to share a video featuring some tips on how to layer your products for the best results! The way you layer your skin care products can have a major impact on how well they actually work. We've got celebrity aesthetician Jordana Mattioli here to share her best kept secrets on how to layer skin care products like a pro. Once you figure out the cause of dark circles, they become a little easier to effectively treat. The easiest way to do this is press on them gently. If they lighten up for a second , they are probably caused by little blood vessels showing up under the skin, where skin under the eye is thinner). If they don't, then it might be excess pigment, caused by sun exposure or even be hereditary. cle de peau concealer: this twist up stick formula is so richly pigmented, it could last years. but please don't keep it that long. clinique airbrush concealer: this is my i don't have time to put on concealer concealer, because its super sheer & comes in a click pen style applicator, no separate brush needed! nars radiant creamy concealer: creamy and hydrating, tons of shade options. THE LONG TERM With most things in life, I always recommend trying the easy way first. For little blood vessels, try a cream at night that contains a retinoid. Retinoids are proven to build collagen and thicken the skin, which can help make the veins and blood vessels less visible. Start out with an over the counter version like Dr Dennis Gross Ferulic + Retinol Triple Eye Correction Serum. Once that runs out, talk to your dermatologist about a prescription retinoid to use at night. Tretinoin cream in a .025% strength seems to be well tolerated around the eyes. If you suffer from seasonal allergies, you can also try an over the counter antihistamine which can really help lessen the appearance of blood vessels. If you don't get enough improvement, a little medical intervention can help. Your dermatologist can do a few tiny injections of a hyaluronic acid filler which would sit closer to the surface of the skin and help cover the blood vessels. If your dealing with under eye circles that are pigment related (and not blood vessels), the easiest option is to lighten them with a brightening cream. Some ingredients to look for are licorice, kojic acid, and hydroqunione. My top picks are Kate Sommerville Spot Reducing Concetrate or Philosophy Miracle Worker Dark Spot Corrector. These usually take about 4 weeks before you'll start seeing results. For more dramatic improvement, you can try a few laser treatments to remove the pigment. A few Clear and Brilliant or Fraxel treatments will erase any darkness over 3 to 5 treatments with little downtime. Besides that deliciously salty meal from Momofuku last night, theres tons of other attributes to why puffy eyes happen. A night of cocktails, fatigue, a good cry, seasonal allergies; basically you name it and it probably can cause fluid to build up under there. Great news: Theres some great quick fixes for your occasional puffiness! And then theres us unlucky few, where chronic puffy eyes is a constant issue. This is most likely due to genetics and the positioning of fat pads under the eye. The quick fixes below can help temporarily, but medical intervention is more of a long term solution for constant puffy eyes. Anything Cold! Stick a set of spoons in the fridge for a few minutes, and hold the smooth part under your eyes. Even better, use them to massage in eye cream. While your at it, keep your eye cream in the fridge too. Brew some caffeinated green tea, or chamomile tea, then put the teabags in the fridge for a few minutes. Once they are cold, plop them on your eyes for a few minutes. Try an eye mask designed for staying cold that you can always have handy. Ten minutes or less should do it. 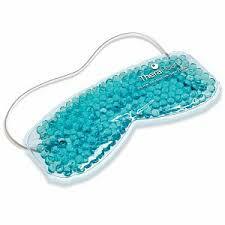 I like Therapearl's eye mask. Cucumber slices, that old cliche, can work too. They are mostly water, but they have a natural anti-inflammatory soothing effect too. Keep them chilly before putting them on. Diet: Salt (sodium/ processed foods) and alcohol cause water retention. Try lowering your intake of those that and see what happens. Drink plenty of water and try more anti-inflammatory foods. Sleep: Yes, you should be getting lots of it, but also keeping your head a little more elevated as opposed to sleeping flat will help fluid retention. Antihistamines: If you struggle with seasonal allergies, this can make a huge difference. Talk to your doctor or allergist about taking an antihistamine, or using special eye drops. Surgery: There is no right or wrong age to start thinking about cosmetic surgery, and I have seen them performed as early as mid-thirties. Having worked in a plastic surgery practice, the most common thread among patients is "I wish I would have done this sooner". The thought of surgery might sound absurd to some people, and thats ok! Its not for everyone. If you do want to research this route, you'll find its more affordable then you think (as far as surgical procedures go), an easy recovery, and your looking great in a few days. Injectable Fillers: For a less invasive approach, theres injectable treatments that can get strategically placed to help minimize chronic puffy eyes. Fillers like Juvederm or Restylane are clear, mushy substances made from hyaluronic acid which we have in our own bodies. The injections are painless (your doc will put on a little numbing cream so you won't feel a thing), and even though you can get a little bruised for a few days, this type of treatment can last almost a year, sometimes longer. I've personally had this done numerous times with excellent results. This type of procedure can cost between $500 and $1200 depending on how much actual filler is used. Also to note, if you aren't thrilled with the results, you can have another injection to dissolve it. It's mid-summer here in NYC, and while that means ice cream festivals (yes, this is a real thing) and more outdoor brunches, it also means shorter hemlines and sleeveless everything. Unless you are Dita Von Teese, some of us just look a little better with a sun-kissed glow. We know to stay away from tanning beds and to wear SPF, but there must be a way to meet in the middle... Enter self tanning! Take a CSI style shower a few hours before hand; shave, exfoliate really well with either a non-oil based scrub or washcloth/loofah. Dab moisturizer on knees and elbows so self tanner doesn't make those areas too dark. Throw a dark sheet on your bed the first night you apply it, or sleep in dark PJ's. If your tanner comes with a little applicator mitt, use it! Or try a tanner applicator glove. Dry for at least 10 minutes, longer if possible, before getting dressed or going to bed. For hard to reach areas, if you don't have a friend or hubby to help with your back, my Macguyver trick is to put the tanning mitt over my body brush. to get my back. Voila! Don't rub too much, gentle smoothing is all you need, let the tanner do the work. Try sanitizing wipes or hand sanitizer to clean the bottoms of your hands and between your fingers and toes. If you didn't use a glove, and didn't wash your hands fast enough, try exfoliating the area with a scrub a few times. There are also fake tan removers or you can try rubbing half a lemon on the area. Moisturize! The drier your skin, the faster and more uneven your tan will fade. As long as you moisturize right after a shower, your tan will last and fade evenly. VITA LIBERATA TAN MOUSSE its a foam, dries in a minute, and no lingering smell. Try it a few nights in a row for color that lasts a long time. I'm talking weeks. Plus its kim k's fave, and her tan always looks perfect. ST. TROPEZ Anything this company does is goddess level bronze. There are sprays, mouses, lotions, even a new dry oil formula. JAMES READ SLEEP MASK TAN This actually smells really good, but there is no telltale tanner smell; and its loaded with great ingredients for your skin too! BARE MINERALS FAUX TAN FACE Another 'faces only' tanner. Amazing ingredients, and natural looking.